Women across the country are leading protests at the offices of several U.S. senators, calling on them to block the confirmation of Supreme Court nominee Brett Kavanaugh, who has been accused of sexual misconduct by two women. Collins, a pro-choice Republican, holds one of the crucial swing votes. She wants to delay the vote in order to hear Dr. Christine Blasey Ford’s testimony. 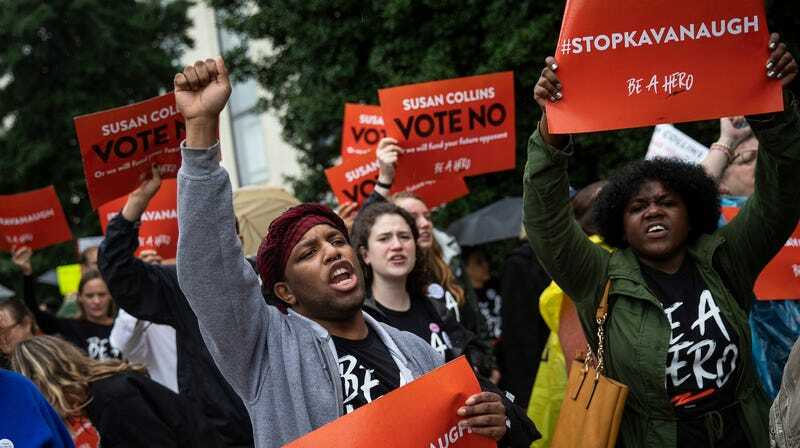 More than two dozen organizations, including the National Domestic Workers Alliance, Planned Parenthood, and the National Women’s Law Center, have united to stage a national walk-out at 1 p.m. eastern, calling on supporters to “wear black, walk out of their workplaces, homes, and classrooms, and post photos online with the hashtag #BelieveSurvivors.” Protesters are also planning to rally outside the offices of Colorado Senator Cory Gardner, Nevada Senator Dean Heller, Arizona Senator Jeff Flake, Texas Senator Ted Cruz, and others.